I took a trip to my favourite cafe this week – ok that’s a fib, I took several trips to Duchess of Spotswood this week. I was inspired – this is my version of a dish they have on their menu. 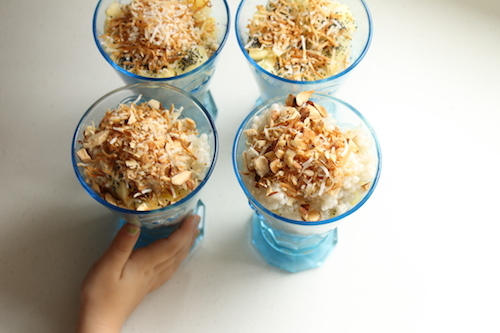 Meet my Lime Coconut Tapioca pudding. Tapioca is a great fertile food. It is high in folate and B9 vitamins – making it equally necessary for those trying to conceive and pregnant women alike. It also sports a decent amount of iron and calcium. Best of all, it has substantial amounts of Omega 3’s and 6’s – wonderful for every almost every body function but especially important for brain development of the growing baby. It’s a great ingredient to pop in your trolley this week! To make the most of the delicious flavour of the pineapple, best prepare the night before. Once skin and core has been removed, slice very very finely (as finely as possible), place in a bowl, cover and leave overnight to allow to sweeten and the juices leach out. To make the pudding, combine tapioca, coconut cream, water and vanilla bean seeds (you can pop the bean in too, just remember to remove it). Place over a low heat, stirring very regularly until simmering. The mix will begin to thicken. Allow to simmer for 10 minutes or until tapioca just begins to go clear. Turn heat off and place lid on, allowing pudding to cook a little further. Once cooled, squeeze in the juice of 1/2 a lime and stir well – fluffing up the pudding and loosening the tapioca balls. 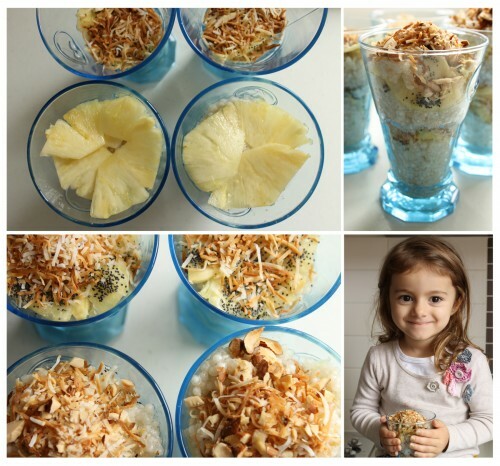 To serve, layer tapioca pudding, pineapple, poppy seeds, almonds and coconut and repeat several times. If there is juice remaining from pineapple, drizzle over the top of the finished glass. Pineapple not your thing or you avoiding high sugar fruits? You can switch for any fruit you desire – berries would work really well as would mango. Serve at room temperature and keep away from little mitts until desert time. Ohhh looks delish! I haven’t tried tapioca before so will def have to get some and give this a try, yummo! I thought tapioca balls is a refined food and that it has only starch.